Alright, I lied, I’m going to do an update every week of this challenge, so instead of 2 updates, I’ll give you 4. Lucky you! If you missed the plan, check it out here. Some notes. I am currently working out 6 days a week and nursing a very hungry baby girl, so my carb needs are higher than if I were just going to work, sitting, coming home and sitting some more. I am shooting for 100g of carbs a day. What does that look like? One cup mashed plantain is about 60g and 1 cup sweet potato is about 58g. Sometimes I am over 100g, but not by too much. I feel good at this level – energy-wise and hunger-wise. For example, I can go 4-6 hours without wanting to kill someone for food. Second note, I didn’t take a picture of everything. But when I missed the pic, I made a note. Thirdly, I am making some tweaks along the way because this simple act of taking pictures of my food and reporting on it makes me acutely aware of how many plantains I eat and how much caffeine I consume. Too much of anything is not good, even if it is delicious ripe plantains with salt and butter. YUM! Lastly, I drink a lot of water between meals, about 60 ounces. You might not need that much water, but I do – again, exercising, detoxing, nursing. My body needs H2O to do all of these things. Breakfast: Mashed plantain with olive oil and cinnamon. Kale, 1/2 green apple, cucumber smoothie with one TBS collagen. Bone broth. 1 cup black tea. Lunch: Leftover citrus pulled pork with lettuce and onion, radish radicchio salad (I ended up not eating this, the radishes were waaaay too bitter for me, eh, you win some, you lose some), cucumber and 1/2 green apple. Dinner: Sweet potato, ground beef with cauliflower rice, broccoli. Plus a smaller second serving of everything. Breakfast: Seaweed salad, apple, kale sweet potato smoothie, bone broth. 2 cups organic green tea. Lunch: Leftovers from last night. Jicama with lime juice & Real Salt. Carrot, cucumber and chicken liver pate. Dinner: Baked chicken thighs. Cabbage & carrots sautéed in red palm oil. Second smaller serving of everything. Banana & frozen cherries. Lunch: Leftovers from last night. Jicama with lime juice & Real Salt. Carrot & cucumber for dipping in chicken liver pate. Dinner: Frozen cherries (not pictured). Canned salmon (6 ounces), mashed Japanese sweet potato, roasted brussels sprouts. 1 TBS olive oil. I had a second small serving of brussels sprouts and sweet potato too. Symptom Check-in: Suuuuuper bloated. My husband put a BIG heaping spoonful of Natural Calm in some hot water last night, no bueno. The bloating didn’t hit until later in the afternoon, not sure if it is related, but my guess is yes. Roger that, body, I don’t need that much magnesium. Breakfast: Kale, Japanese sweet potato smoothie with 2TBS collagen and a little cinnamon. Not pictured is about 1 cup steamed frozen broccoli with 1 tsp ghee. Lunch: Giant salad – romaine lettuce, Brussels sprouts, quick pickled red onion (pickled with grapefruit juice), 1 scallion, 1 tsp Kelp salt (yayy iodine!). Also celery & carrots sticks for dipping in chicken liver pate. Not pictured is 1 small bag of plantain chips (head smack! ), ok, they’re not that bad – fried ripe plantains in palm oil, that’s it. I’m over it, and it won’t happen again. Dinner: Ground beef with chopped kale, collard greens and peas. Roasted acorn squash. 1 cup of dandelion root tea. Breakfast: Mashed plantain with 1 tsp ghee, broccoli with 1 tsp olive oil & kelp salt, leftover ground beef from last night. 2 cups green tea. Lunch: Giant salad – romaine, carrot, capers, zucchini for dipping in chicken liver pate and a bag of SeaSnax, yes, the whole bag. Green tipped banana. Not pictured, 1/2 sweet potato with butter and cinnamon. 1 cup peppermint tea. Dinner: AIP Magic Chili, with added horseradish powder. 1 cup dandelion root tea. Symptom check-in: Still feeling a little bloated. I don’t know. I was also really crabby today, might be a side-effect of the detox. Otherwise, skin on my hands and face is feeling smoother and less red. Yayy! Breakfast: Mashed plantain, steamed kale with EVOO, bone broth. 2 cups green tea. Lunch: Leftovers from last night, apple and fennel salad, homemade cranberry jello. Dinner: This is a throw together dinner, totally random stuff because I forgot to take the fish out of the freezer. Doh! Watermelon radish salad, ground beef leftovers from a few nights ago, sweet potato and celery for dipping in chicken liver pate. Mug of bone broth. 1 green tipped banana. Breakfast: Roasted butternut squash, zucchini slices for dipping in chicken liver pate. Bone broth. 3 cups black coffee, 2 were half-caff. Lunch: I didn’t eat enough for breakfast so I got hungry around 10:00 and I ate the homemade cranberry jello with some defrosted peach slices. 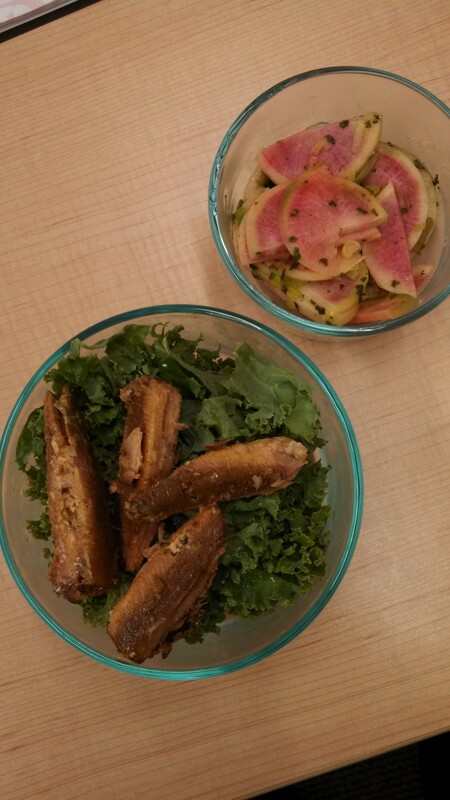 Then at lunch time I had sardines and kale with watermelon radish salad. Dinner: Pork fried “rice” (cauliflower rice) with carrots, broccoli, onion, scallion, bean sprouts. Not pictured is one mashed plantain and a little apple/fennel salad. So far I am feeling pretty good and as I write this I can already see the end of week two in sight with my meals planned and plenty of good food to keep me from making bad decisions. Does this look like fun? Want to join me?